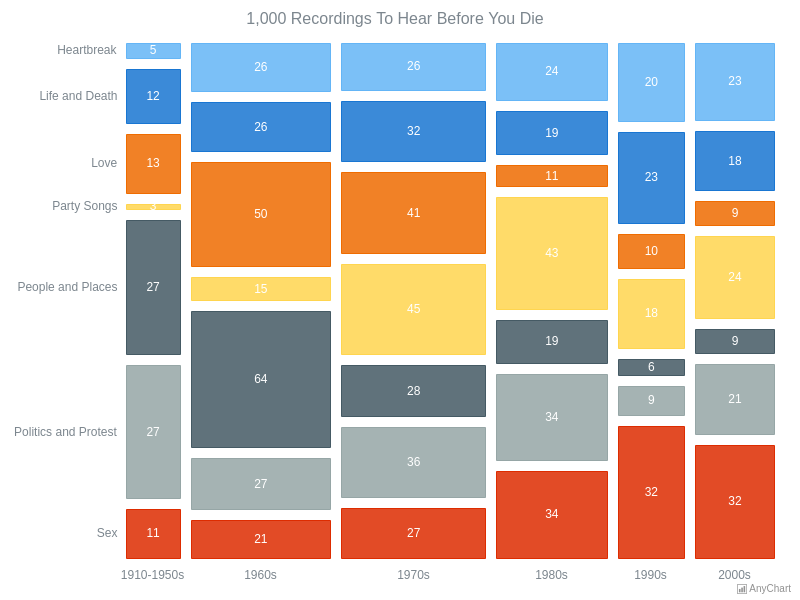 1000 Recordings To Hear Before You DieMosaic Chart visualizing data about the 1,000 greatest music masterpieces. Such a representation helps explore the relative prominence of different song topics along with time periods. 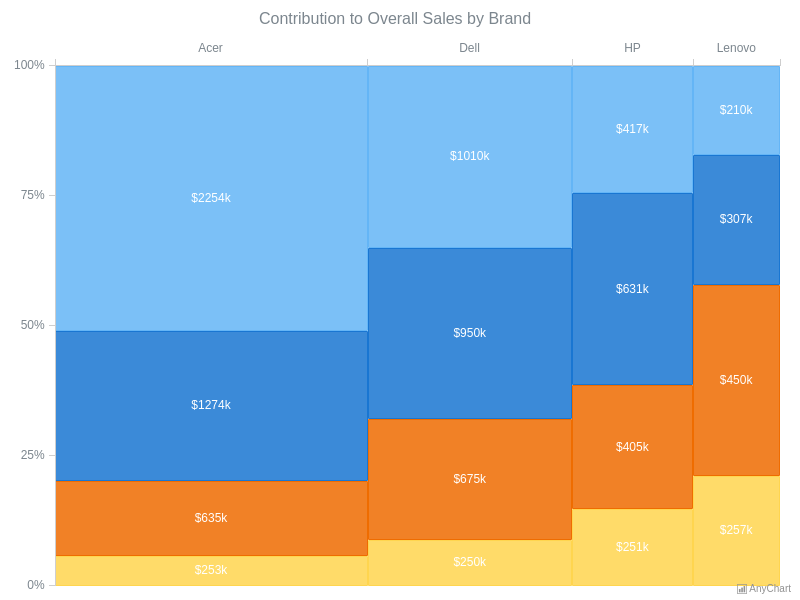 Contribution to Overall Sales by BrandMekko Chart of sales data by segment (laptop, desktop, tablet, and phone) and brand (Acer, Dell, HP, and Lenovo). The visualization is helpful in quickly understanding the best (and worst) selling product groups. 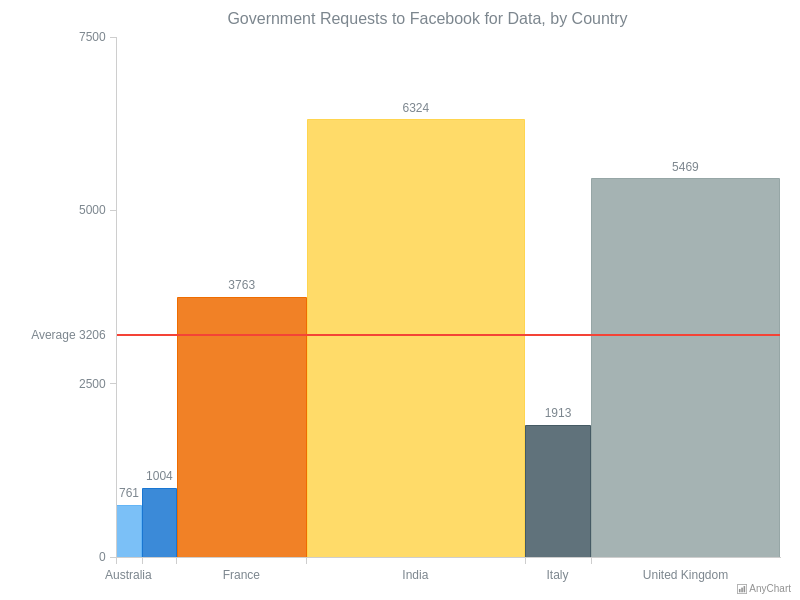 Government Requests to Facebook for Data, by CountryBar Mekko Chart of data requests received by Facebook from six governments: Australia, Canada, France, India, Italy, and the UK. A line marker is used to visualize the arithmetic average. 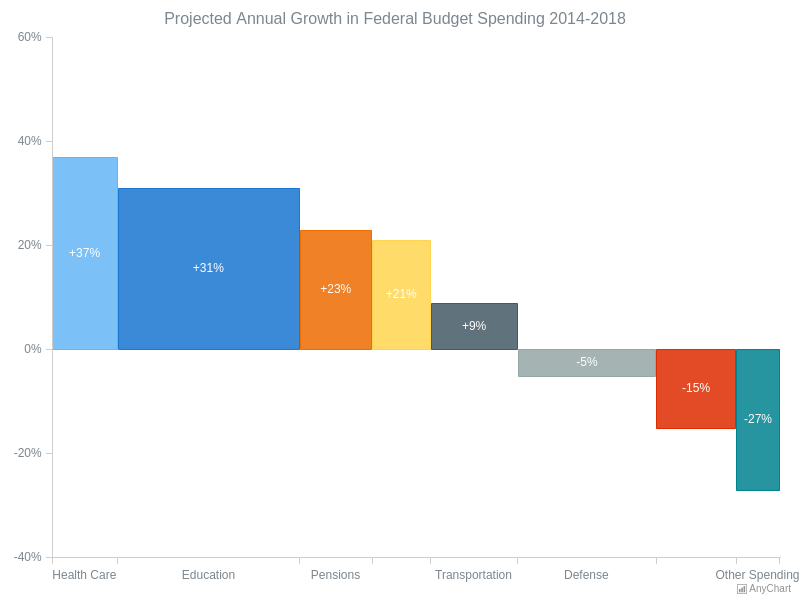 Projected Annual Growth in Federal Budget SpendingBar Mekko Chart showing the annual change in federal budget spending for 2014-2018 by category. Each point of the series is assigned with weight that determines its width. Weights are introduced through a set of numbers, where each element is a point-specific weight multiplier. 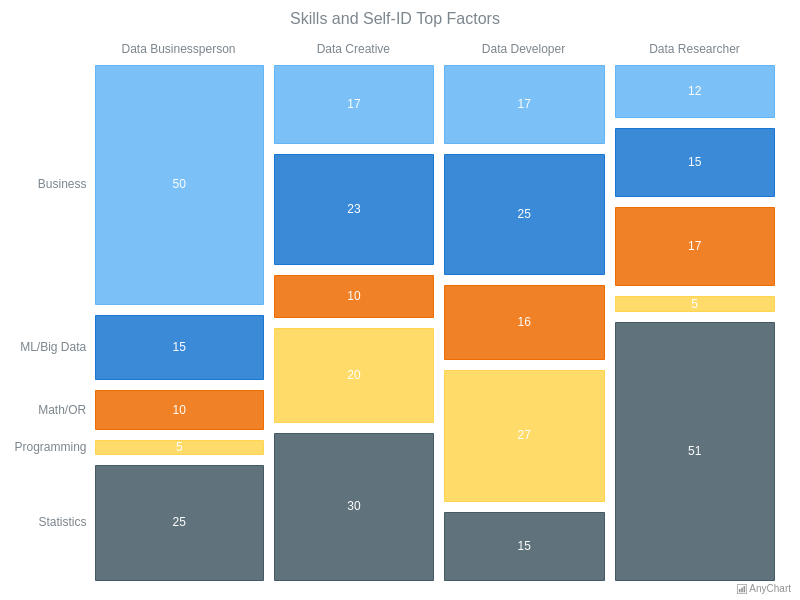 Skills and Self-ID Top FactorsMosaic Chart illustrating the importance of five different skills - statistics, programming, mathematics and operations research, machine learning and big data, and business - for each of the four data jobs: Data Businessperson, Data Creative, Data Developer, and Data Researcher. 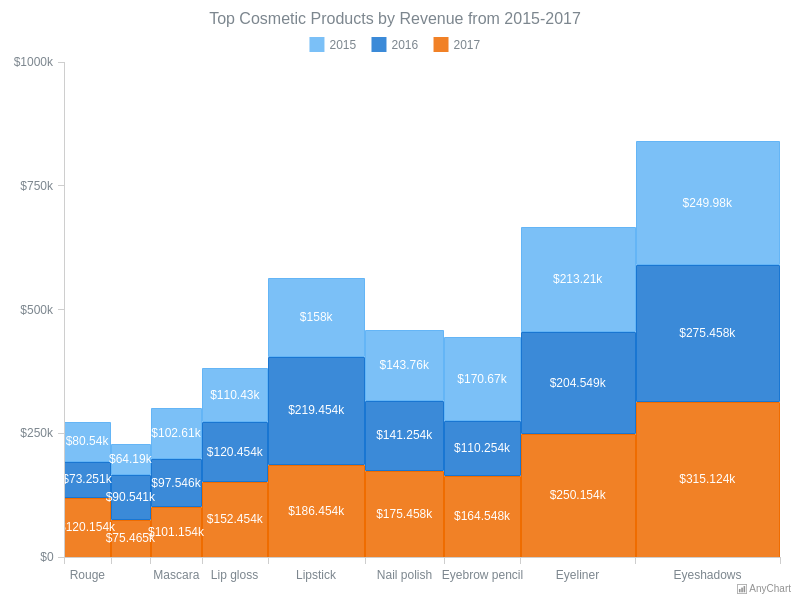 Top Cosmetic Products by Revenue from 2015-2017Mekko Chart visualizing annual product sales data over three years. Labels and tooltips are customized by means of converting revenue values to formatted strings.